Why Cain’s offering was rejected? So what happened next? Is it a Conspiracy…? Cain and Abel were the first children who were born to the first man and woman who God had created. Most probably they were twins because the Bible says, “1 Now Adam knew Eve his wife, and she conceived and bore Cain, and said, “I have acquired a man from the LORD.” 2 Then she bore again, this time his brother Abel. Now Abel was a keeper of sheep, but Cain was a tiller of the ground.” (Gen 4:1-2). This verse says that Eve conceived once and bore Cain and then she bore again. In other words, Eve conceived once and bore twice. Anyway, Cain was the elder and Abel was the younger. The Hebrew meaning for the word ‘Cain’ means ‘acquire’. When Cain was born, immediately Eve thought that she has received a man who will deliver them from the curse that has come upon them because of sin (Gen 3:15). She was really excited to know about this man that she has produced. When nothing really happened immediately as Cain was just a baby boy, Eve was really disappointed and named the next baby boy as ‘Abel’ which means in Hebrew ‘Breath or Nothing’. 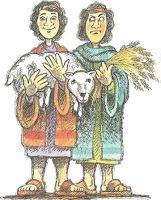 Abel became a Shepherd and Cain became a farmer by profession as they grew up (Gen 4:2). After giving birth to Cain Eve said, “I have acquired a man from the LORD”. Though this statement may seem to be a spiritual statement from Eve, it is a self-confident statement with a preconceived idea that Cain will be that promised man who will deliver her from the curse of Satan. In other words Eve was saying, ‘I have produced [i.e. brought forth] a deliverer, champion and a great man’, but added the Lord’s name at the end of the sentence to give it a religious color. She was so mistaken that she was discouraged to expect nothing or just a human being breathing with life as usual with her next baby boy Abel. Discouragement comes only when we have preconceived ideas from our own soul with which we mistakenly accept something that is not from the will of God as though it is. This is lack of humility and faith relationship with God, instead this is a religious one that takes what God has said and make a God out of it. In contrast hear what the faith filled Mary said when God told her through the messenger angel Gabriel that she will bear a Son who will be the deliverer of all mankind, “Behold the maidservant of the Lord! Let it be to me according to your word.” (Luke 1:38). 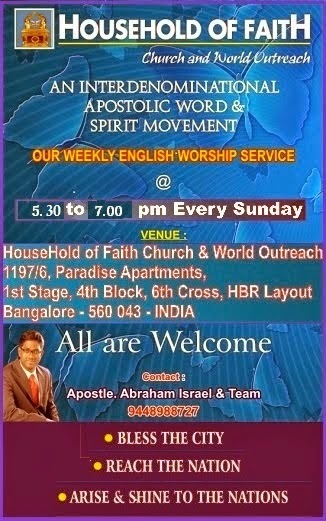 Spiritually speaking, the Lord is looking for such faith filled spiritual womb of the heart to birth his end time vision of “pouring out his Spirit on all flesh” (Acts 2:17). God is seeking for people in our generation with faith-filled heart attitude based on hearing God on a day-to-day basis, with humility and servant hearted acceptance and obedience to the Lord and His Holy Word without a second thought like Mary the mother of Jesus. Saint, do you desire to be that God-pleasing person? If your answer is yes, then you are that Spiritual person who will be blessed before all the religious minded people of this generation who will be discouraged like Eve for expecting something that is not in the will of God as though it is. You who are Spiritual will be joyful through your tough circumstances while the people around you will feel gloomy and discouraged. Praise the Lord! When God created the first man Adam and first woman Eve, they were perfect beings connected to God intimately and were in communion with Him (Gen 3:8). They were in the very image of God with His glory covering all over their spirit, soul and body. Because of the command of God’s Blessing over their lives, they had dominion over all the creations of God (Gen 1:26-28; Ps 8:6). God Himself was very pleased to see Adam and Eve covered with His very own glory and dominion that He said ‘the very sight of seeing them was “very good” and satisfying’. Till Adam and Eve came in to existence, at the end of each day of creation God just plainly told that the thing He created were “good” except the second day in which Satan and his evil minions must have taken legal residence in the atmospheric air of the heaven (Gen 1:6-8; Eph 2:2; 3:10). But seeing the reflection of His own image in a man and woman whom He has created on the final sixth day, God was so excited that He felt the very sight of seeing a man and a woman was “very good” (Gen 1:31). After the creation of the earth, the earth was very good under man’s dominion. As man was created with a free will to choose between good and bad which is the image of God, God commanded Man to choose obedience freely out of His own free will (Gen 2:16-17). But there in the heavenlies was this invisible enemies of God [i.e. Satan and his cohorts] looming to get in to the earth to control it through deceit. Satan was thrown out of heaven sometime before creation in the eternity past when he convinced one third of God’s angels with a better kingdom on earth than God and tried to capture a seat of residence in God’s capital city of Zion in heaven from which God as the moral and civil governor rules the whole earth (Rev 12:3-4; Isaiah 14:13-15; Ezek 28:14; Rev 21:10; Heb 11:10, 15; 12:22). He was thrown out of heaven as a result of such rebellion against God’s authority (Isaiah 14:12). Satan because of pride that came as a result of his beauty wanted to make himself equal to God and be worshipped by fellow angels in heaven and supposed to be created humans on earth. By doing so he has corrupted his wisdom for self-deception (Ezek 28:17). People ask, ‘Who made Satan?’ God created only a powerful, beautiful and wise angel ‘Lucifer’ which literally means ‘Day Star’ and gave him a choice to follow Him and serve Him (Is 14:12). He was next only to God in wisdom and power (1 John 4:4). But when his heart was filled with pride and for the sake of his splendor corrupted the wisdom of God that operated in him, his heart got filled with violence and he sinned (Ezek 28:16-17). Pride is a wrong thought which thinks highly of itself than others. Violence is a revengeful thought to hurt someone. These are bad emotions that came out of Satan’s bad choice. These bad emotions are absence of God and His goodness in a being which operates by the power of conscious thought, by personal choice of the thinker to express itself without God. For example, nuclear power used for a good purpose like producing electricity becomes a good power; the same when used to destroy another person or nation becomes a bad evil power. In other words, God just created power but people use it to do evil things. If God did not create beings of free will, they would not be creative like God Himself. Even God testified to this fact when He said, “14 “You were the anointed cherub who covers; I established you; you were on the holy mountain of God; you walked back and forth in the midst of fiery stones. 15 You were perfect in your ways from the day you were created, till iniquity was found in you.” (Ezek 28:14-15). God just created a perfect being that had a free will and ability to act by itself. In other words, God did not create evil but when Lucifer the highest angel sinned in rebellion to God that is when sin came in to the universe. A good angel became Satan because of his own foolish prideful choice to act by himself apart from the good God and his goodness. The word ‘Satan’ in Hebrew means 'superhuman adversary, one who withstands.' The word ‘Satan’ in Greek is ‘Satanas’ which means 'adversary (one who opposes another in purpose or act). The name given to the prince of evil spirits, the inveterate adversary of God and Christ [i.e. he incites apostasy from God and to sin, circumventing men by his wiles, the worshippers of idols are said to be under his control, by his demons he is able to take possession of men and inflict them with diseases, by God's assistance he is overcome, on Christ's return from heaven he will be bound with chains for a thousand years, but when the thousand years are finished he will walk the earth in yet greater power, but shortly after will be given over to eternal punishment].' He convinced the other one third of good angels to follow him by deceitfully promising them with greater freedom, power and a future. The phrase ‘demon-possessed’ and ‘possessed by the devils’ (Matt 4:24 NKJV, KJV) are interchangeably used. And both mean the same. The word for 'Devils' in Hebrew is 'shed [pronounced 'Shad']' means 'Demon' (Deu 32:17; Ps 106:37). Then this group of angelic being became demons. The Bible says, “…sin is lawlessness” (1 John 3:4). When God’s perfect law was broken for the first time, sin came in to the universe and it began to spread through all the evil hordes of Satan and his minions (Ps 19:7). The first man and woman who were tested by God to exercise their free will to either obey God or reject Him, turned out to be a disaster for mankind. Our forefather and mother miserably failed under the deceitful influence of Satan and his demonic angels (Gen 3:1-6). This is the second rebellion in the history of God’s creation. God tests the hearts and minds of human beings to make them realize who they are actually as a conscious free willed creation of God, so that this self-realisation will help them use the ability [i.e. inherent power of choice] to seek God and to be His sons and daughters (Ps 7:9; Eccl 3:18; 1 Thess 2:4; Ps 53:2). As a result of the fall of humankind from the glory of God (Rom 3:21), humankind became helpless as a pawn in the hands of the devils. From then on Satan began to use mankind to fulfill his very own desire (John 8:44). He did this through injecting his thoughts and then making the thoughts to be accepted by the humans, after which they will fulfill the desire of the thought that has come to them from Satan and thus will also think of that thought as their very own human thought after a period of time (James 1:14-15). In other words, Satan uses the power of suggestion to stir up emotions which are inherent and God given within humans and then make them do his bidding. So only Apostle Paul advises the believer to destroy every thought that comes in to the mind of a believer which are not in-line with the word of God (2 Cor 10:5). When thoughts are taken captive by rejecting it in the name of Jesus verbally, it has no more power over you to influence you to do it bidding. This is why the Bible says, “Resist the Devil and he will flee from you.” (James 4:7). The moment the fall of human beings happened man sought to appease the consciousness of God’s eternity within him through his effort to cover himself with his own self-made works of his hands (Eccl 3:11; Gen 3:7). This is where the first religion was born. It was man’s quest to keep himself right with God though His own self-defined formula designed by him. If we ask the question to our self, ‘Who taught man religion?’ The answer is nobody, but himself. This religiosity did not really cover their God shaped eternal vacuum in their heart. Instead it made them afraid to approach God, made them spiritually and physically naked before Him and caused them to hide themselves when God really approached them (Gen 3:10). This religiosity also caused Adam to accuse Eve and then God, when God asked whether he disobeyed his command (Gen 3:9-13). Religious people will not take responsibility for the wrong they do or have done, but will always try to accuse others and even God Himself for their failures. When God asked Eve ‘What is this you have done?’ immediately she accused Satan for her failure. Religious people will always blame Satan and demons for their failure instead of taking responsibility for their own fault. They will have a religious scapegoat cliché ready to spurt out like, ‘O the devil made me do it.’ or even ‘The Lord God is tempting me through this trial.’ Some good religious polished people will say, ‘I am sorry, that evil man misinformed me and made me do it.’ This is total nonsense. These religious people will give such statements to cover up their own faults, foolishness and nakedness by blaming everyone else but themselves. After Eve, God did not ask Satan why you did it. Instead He straightly pronounced His curse upon him because of his rebellion in his heart. No second chance for Satan because he has made up his mind to continue in his lies forever along with his demonic cohorts who follow him (John 8:44). The Bible also confirms Satan’s attitude of crookedness by saying, “What is crooked cannot be made straight” (Eccl 1:15). To Adam and Eve God brought forth just punishment as a just God (Mal 2:17). In short religious people are critical people with no self judgment at all (1 Cor 11:31). They will always play the blame game without fail. They will do all kinds of works based on what they think as right, which they also assume as perfectly accepted by God (Prov 14:12; 16:25). This is the way in which a lot of people are travelling, which in the New Testament Jesus called it as the “broad …way” (Matt 7:13-14). It is very easy to use the broad way, choose you own god and appease yourself and your conscience by covering yourself with a religious robe of righteousness. Many self-righteous religious Pharisees travelled this way during the time of Jesus Ministry 2000 years ago (Luke 18:9). The person who does such thing God calls him as an “unclean thing” and his so called self-made religious righteousness as the “filthy rags” (Is 64:6). At end of such religiosity, much curse came upon Adam and Eve (Gen 3:7-19). Religiosity is a law based living. For a Christian or Jew who is religious will make the law given to him as God Himself and keep it thinking that he will be rewarded by God for it. This is a self-deception. Some of the Jews being self deceived even went to the extent of thinking the very eternal life of God resided in the written law Book of God (John 5:39). These Jews who thought self-righteously based on keeping the law will be judged by the very law that they tried to keep by their own effort (Rom 2:12). Pagans who have their own religion based on what they think as right thing which will lead them to heaven will be judged based on the law written on their hearts (Rom 2:14-15). All religious people will come under the curse of God because God did not demand such works from them, but they chose to appease their conscience by their own religious works (Gal 3:10). There is no real salvation in all the religion of man, but only an outward appearance of salvation. It is like a thirsty man trying to quench his thirst by going toward a mirage thinking that it is an oasis in the desert. At the end of his hard journey is death. Immediately after God’s judgment came upon Adam and Eve, the Bible continues by saying “And Adam called his wife’s name Eve, because she was the mother of all living.” (Gen 3:20). What does it imply? 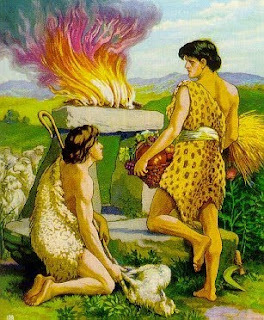 It implies that both Cain and Abel’s life and those who were born after them came in to the world with a sinful nature within them, and through causing a curse of pain they entered in to a cursed world of sin and death, and finally in to a dangerous world which was looming with a invisible enemy whose only desire is to kill, steal and destroy humans for ever (Gen 3:14-19; John 10:10). The Bible rightly says, “…through one man sin entered the world, and death through sin, and thus death spread to all men, because all sinned—“ (Rom 5:12). Because of one great mistake of our forefather Adam all of us humans who are his children in the natural got cursed. The Bible which says about Adam, “…in the image of God He created him” (Gen 1:27), later in Genesis fifth chapter after the fall the Bible says , “...Adam lived one hundred and thirty years, and begot a son in his own likeness, after his image, and named him Seth.” (Gen 5:3). This clearly conveys the message that all those born to the first couple Adam and Eve after the fall of humankind in to sin were born in the likeness of Adam’s sin nature and not in the perfect image of God (Ps 51:5). Of course even with the sinful marred image of God, still man retains the distinction of being in the image of God at least partly (James 3:9). This true image of God in perfectness is restored only when a human believes in the Lord Jesus Christ through the gospel to be saved from sin and to get himself transferred from the power of Satan to God and from darkness to light (2 Cor 4:4; Acts 26:18; Eph 2:1-3). The first Adam represented his progeny physically in that great test in the Garden of Eden (Gen 2:15-18). The last Adam Jesus Christ represented his progeny [i.e. children of God by faith (Gal 3:26, 7; John 1:12)] spiritually in that great test in the Garden of Eden which by then became Wilderness due to the curse upon mankind due to sin (1 Cor 15:45, 47; Matt 4:1; Luke 4:13). The true living creator of this world is not only a ‘God of justice’ but also a ‘God of love’. If the God who judged Adam and Eve, and also cursed Satan for his deceptive work would have ended His conversation and works at that point of time and moved away to His abode in heaven (Psalm 115:16), humankind in its sinfulness would have been lost forever (Gen 3:14-19). The earth would have become a living hell immediately which in turn would have made the Lord of Justice to step in and Judge humankind for its sinfulness as in the days of Noah (Gen 6:5-7). Without the life and light [i.e. revelation of God and His character of purity] of God in man (John 1:4), mankind would have been wiped out under the destructive clutches of all sadistic devils whose only desire is to steal, kill and destroy mankind because of jealousy over them (John 10:10). But thank God for the other facet of God’s characteristic which as the Bible describes, “8 The LORD is merciful and gracious, slow to anger, and abounding in mercy. 9 He will not always strive with us, nor will He keep His anger forever.” (Ps 103:8-9). In other words, as fast he became angry towards Adam and Eve for their sinful behavior which has forever positioned mankind under its destructive clutches, still faster God rebounded with the other facet of Himself which is His mercy. Then the love story of God towards man continues. God did something marvelous and set up a merciful institution after this to approach the same ‘God of Justice’, which would have never been possible if had He not initiated it. The Bible stops the sad fallen man’s story and continues with good news of God’s story for mankind just before the end of Gen Chapter 3 saying, “Also for Adam and his wife the LORD God made tunics of skin, and clothed them.” (Gen 3:21). God because of His mercy and love immediately began to relate to that part of the spirit of man inside him through His Holy Spirit, even after the fall of man in to the sinful weak state where he did not have any strength to avoid sinning except through believing in God. True God related, but with a condition. The condition He instituted as a God who rules man based on his willing choice is, through the blood of an innocent animal only God could atone and agree to overlook man for his sinfulness (Heb 9:22). God related with Adam and Eve by conveying to them the spiritual message that they can contact Him only through covering themselves with a blood soaked garment of a sacrificed animal to cover themselves and their nakedness both spiritually and physically. This He did to convey to Adam and Eve the clear message that the Messiah they were waiting for will one day come as like the innocent animal they sacrifice to make atonement for their sins (Ps 65:3), so that by faith in God’s mercy at that present time their sinfulness will be forgiven and again they can enjoy the presence of God as before the fall of humankind (Rom 5:1). This is the greatest act of love which God fulfilled in the cross of Calvary nearly four thousand years after this act of God in the Garden of Eden, where God made the Lamb of God [i.e. Jesus Christ (John 1:1:36)] who knew no sin to become sin for the sake of saving humankind back to relationship with Himself (2 Cor 5:21). In other words, God positioned sinful Adam and Eve back to the righteous position they had before the fall through covering them with the blood soaked skin of an innocent animal. What part did Adam and Eve play in their part for positioning themselves right with God as before the fall? The answer is nothing. But immediately understanding the significance of God’s work of redemption through the blood of innocent animal, they believed God and accepted His righteous clothing of animal skin. This is true Spirituality. Even in our present time after 6000 years have passed, all we need to do in order to contact God and have relationship with Him as before the fall of humankind in to sin is to believe in the true Lamb of God Jesus Christ as the covering for all our sinfulness. The very word ‘spiritual’ means ‘pneumatikos’ in Greek. The meaning of this word is ‘(1) relating to part of the man which is in the same image, essence and quality to God and serves as his instrument or organ, (2) that which is belonging to the Divine Spirit completely, (3) one who is filled with and governed by the Spirit of God, (4) pertaining to the wind or breath; windy, exposed to the wind, blowing’. A true spiritual man is one who stands in right relationship with God by having been covered by the blood of Jesus Christ through believing in His atoning sacrifice done for Him two thousand years ago. Such men only can draw near to God the Spirit without any fear, shame or self-condemnation on their part (Jam 4:8; 2 Cor 3:17). God is always near to any human closer than the air we breathe as the Bible says (Acts 17:28). But the conscious choice that we make in our life to draw closer to God by the blood of Jesus who is God’s prescribed sacrifice for the removal of the consciousness of our own sinfulness in our soul (Mark 7:21-23; 1 Peter 2:11; 3:21), will bring the consciousness of God’s presence back in to our mind like Adam and Eve enjoyed it before the fall of humankind (Gen 2:25; 3:8, 10). When God’s presence starts to dwell in us we naturally will begin to excel in all things and have the dominion-image of God restored in us. We will enjoy life and will thirst after the presence of God and His blessings. Once we taste the new wine of the Holy Spirit daily in our life, after a period of time we will become addicted to God’s glory of His blessed presence as spiritual drunkards (Eph 5:18). This is what God desires for every man. Having seen how God has taught Adam and Eve the good news of the gospel of Jesus Christ in a nutshell though covering them with the blood soaked animal skin, we have come to understand that they were not ignorant of the message of drawing near to God in their sinful state through offering a blood sacrifice which brings back the presence of God back to them when they sin (Gen 3:21). Not only they understood the significance of blood sacrifice, but they began to enjoy God’s presence as before the fall of humankind in the Garden of Eden. Comparing Gen 3:20 and Gen 4:1 we can clearly see that the restoration of the presence of God back to them made Eve confess, “…I have acquired a man from the LORD.” The blessing of God’s restored presence through God’s physical and spiritual covering over them through “God made tunics of skin” (Gen 3:21) made them to forget their shame and come together to procreate, enjoy one another and have intimacy between them in contrast to the curse they have legally inherited through their disobedience to God’s one perfect command (Gen 2:16-17), this truly made Eve to confess to God from a grateful heart for His faithfulness in spite of their innate sinfulness (Gen 2:24-25). So what? From the above clear exposition we know that Adam and Eve must have surely taught “in the process of time” (Gen 4:3) about drawing near to God through ‘blood-sacrifice’ to Cain and Abel who were growing up, as Eve did later to the company of her offspring’s (Gen 4:25-26). God Himself testified that Cain knew to do well by sacrificing of lamb for sin offering to fellowship with God and receive His blessing (Gen 4:7). Does that mean God only respects the man who believes in God’s ordained way of approaching God and His blessings of favor through blood sacrifices? You bet He is. This is the reason the word of God says “…almost all things are purified with blood, and without shedding of blood there is no remission [i.e. 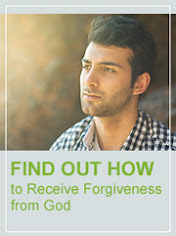 forgiveness for any sins of lawlessness (1 John 3:4)].” (Heb 9:22). Abel became a shepherd by profession and Cain a farmer. Nothing was wrong with Cain’s profession. Initially Adam was placed in the Garden to “cultivate and keep“ the Garden of Eden (Gen 2:15). At this point of time Adam needed no effort to do his work because of the blessing of the glory of God’s presence in his life. 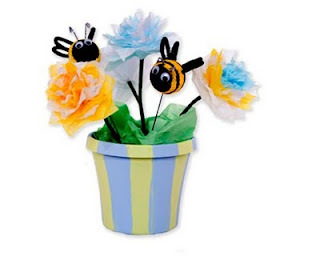 But the fall of humankind in to sin drastically changed the environmental condition of the very ground that must have bloomed without any special effort from man. The ground got cursed and as a result man has to labor very hard through his self effort rather than with God’s strength which was natural to man before the fall. The ground brought forth “thorns and thistles” which also have to be removed with much effort of the sweat of man’s face and body. The result of the curse which was hard labor based on one’s self effort was decreed by God to continue and end only in death which is separation from God for eternity when the physical body returns to dust (Gen 3:17). To say from a Biblical perspective, Cain has to work harder under the curse and needed more of God’s favor to be really successful as a farmer (Gen 3:17-19). But Cain was ready to work harder, earn harder and give the wages of his work to God rather than acknowledge his weaknesses before God and please Him by depending on Him by faith to overcome his weaknesses. Cain was unable to please God because of allowing the sinful nature present inside him to rule his being according to its whims and fancies (Gen 4:7). Cain was a religious man by all means. Religion gives whatever it can give to God with its own strength, labor and self-effort to earn His favor (Rom 4:4). But God is no man’s debtor and so He naturally rejects all such self effort with a continuation of the curse, which He had decreed upon humankind after our grandparents Adam and Eve fell in to sin of lawlessness (Gal 3:10). The Bible then says, “3 And in the process of time it came to pass that Cain brought an offering of the fruit of the ground to the LORD. 4 Abel also brought of the firstborn of his flock and of their fat. And the LORD respected Abel and his offering, 5 but He did not respect Cain and his offering. And Cain was very angry, and his countenance fell.” (Gen 4:3-5). Here in the preceding verses, we see Cain as a religious man without any real faith in the blood sacrifice which he knew is required by God (Gen 4:7), had the audacity to offer his own works before God. I have heard people say that God rejected Cain’s sacrifice because of lack of faith and not because of the content [i.e. “fruit of the ground” which was one of the 5 offerings prescribed by God through Moses] which he brought to the Lord (Heb 11:4). This is absolutely unbiblical. First of all ‘what is faith?’ Faith is the tangible evidence of God’s confidence and evidence inside one’s self that comes in to us when we obey what God has already said to us. As the Bible says “…faith is the substance…and …the evidence” that “…comes [in to us] by hearing, and hearing by the word of God.” (Heb 11:1; Rom 10:17). Cain’s disobedience to God’s instruction by bringing the “the fruit of the [cursed] ground” which is the hard labor of his hands rather than a blood sacrifice was the outward evidence of his inward lack of faith to obey the instruction of the word of the Lord. The “more excellent sacrifice” of Abel is nothing but obeying the voice of the Lord’s instruction to offer a blood sacrifice rather than offering the work of one’s own hands for receiving God’s forgiveness and favor (Heb 11:4; 1 Sam 15:22-23). The promise of God to fallen humankind that He will bring the seed of the woman [i.e. Jesus the Messiah] to bruise the head of Satan the deceiving serpent has brought back the responsibility upon man to believe in God’s promise and act in personal faith which resulted in the outward act of offering an blood sacrifice as symbolic representation of honoring God’s instruction by faith (Gen 3:15; Heb 5:1; 8:5). The first sin that is hidden in the religious attitude of Cain is pride. The stubborn proud attitude of Cain lacked the fear of God which God looks for in each sacrifice, and this attitude is equated in the word of God to idolatry which is worshipping a created thing which is him-self [i.e. his own ideas, will and emotional satisfaction] rather than the creator who has created all things (Pro 8:13; 1 Sam 15:22-23). Idolatry is making an idol and giving it honor to the level the idol worshipping person thinks that the idol rightfully deserves. But the living God demands honor and obedience rather than just a sacrifice. Idolatry is a product of man’s imagination to what he thinks as right in his prideful arrogance and rebellion, rather than to humble himself before God which is the first requirement from God to accept any offering (Is 44:9-20; 66:2-4; Micah 6:6-8). In other words, idolatrous religious attitude is like saying to God, ‘Hey God, if you don’t hear and take the works of my hands which I give you of my own strength, then I will choose to make a god that fits all my instruction and worship it.’ This is purely pride and rebellion. Lack of humility is the other important attribute that Cain was lacking. Firstly, the Bible clearly says, “…God resists the proud, but gives grace to the humble.” (James 4:6). God Himself resisted Cain’s sacrifice because humbly he could have given some of his first fruits in exchange for a sheep to Abel and could have easily offered a blood sacrifice to the Lord which the Lord mandatorily required from all those people who drew near to Him in truth. Because Cain was living in wicked unbelief, the prescribed blood sacrifice was of no value to him. But Abel exactly offered the prescribed sacrifice. Because of the right sacrifice offered by Abel, God immediately accepted it by fire (Lev 9:24; Jug 6:21; 1 Kings 18:38; 1 Chr 21:26; 2 Chr 7:1). God accepted Abel sacrifice because of his faith in the right kind of blood sacrifice (Heb 9:22). Because Cain brought the wrong sacrifice in self-will and unbelief, he did not have the humility to acknowledge his guilt of sinful unbelief and lack of faith in the atonement (Heb 9:22; 11:4). The Bible says “the LORD respected Abel and his offering, but He did not respect Cain and his offering” (Gen 4:4-5). What message does it convey? It shows that the Lord first sees the heart attitude and life of the person who brings the offering and then evaluates his offering according to it (Ps 51:16-17, 19; Mark 41-44; 1 Chron 29:14-17). The man of faith is imputed with the righteousness of God in his spiritual account and is declared as ‘righteous’ by God (Rom 4:5-6). The men of faith in the times past from Adam and Eve continued to believe the atonement promise of the Lord which He prescribed through the blood covenant sacrifice which prefigured the Messiah whom He promised will come in the future and will make an atonement on behalf of them for their past, present and future hidden or secret sins, iniquities and transgressions (Ps 65:3; 79:9; Job 19:25; 13:16; Dan 9:24-26). Abel was such a man who believed that God would make Himself as the sacrificial substitute for all their sins like the sheep that he symbolically offered to the Lord (Gen 4:4; Is 53:7, 6), and thus through the sacrifice “he obtained witness [from God] that he was righteous” and God confirmed His acceptance of Abel gifts of blood sacrifice by consuming it by fire (Heb 11:4). But Cain was a man who did not believe in the right kind of sacrifice which is the atonement sacrifice of blood and thus wickedness started to control his life, he was considered a wicked man by God and his religious works of his own hands were evil because of the wrong sinful attitude which he allowed to control his life (1 John 3:12). Apostle Jude confirmed the wrong rebellious attitude of Cain, whose attitude he compared and equated to the rebellion of Korah and his 250 leadership men of renown who rose up against the God ordained leadership of Moses and Aaron because of their pride, lack of humility and jealousy over the people of faith who are favored by God. Cain was then also compared to Balaam who went to do prophetic religious ceremony in greed for money which motivated him to do those things in opposition to the direct instruction of the Lord (Jude 11; 2 Peter 2:14-17; Num 16:1-3, 26-28, 31-35; Num 22:12, 20, 32-35; 23:3-5). Religious works will always have an outward form of godly appearance but really without the power [or involvement of man’s spirit through God’s Spirit (John 4:24; Rom 12:1)] which is a requirement from God and comes only in obedience to God’s instruction in it (2 Tim 3:5). One of the first reactions of all the religious people when confronted directly about their bad attitude is that they will get very angry about the person who is trying to correct them because of their pride and their lack of humility. Pride, arrogance and the evil way of the wicked God hates and through such person strife will come (Prov 8:13; 13:10). Pride and jealousy are like twin sisters who always go together; both travel strongly towards death and grave (Prov 27:4; 14:30; Sgs 8:6). This religiosity in Cain made him angry against God when he was confronted by Him for his wrong religious attitude, and as a direct result of it his countenance fell. Hence the first instance of man’s wrath was over religion and it did not produce the righteousness of God (James 1:20). Instead it produced only the Satanically motivated conduct of bitter envy and selfish ambition in the life of Cain, which later got conceived in his heart desire strongly and gave birth to sinful attitude, the sinful attitude of his heart later led him to murder his own brother Abel (James 3:13-16; 1:14-15; Matt 5:21-22; Eph 4:26). Cain’s wrath was without excuse, for God still offered to accept the right sacrifice of the lamb or sheep with faith in the atonement (Gen 4:6-7). God corrected Cain’s wrong attitude because of His love toward him. The writer of the Book of Hebrews rightly said, “6 For whom the LORD loves He chastens, and scourges every son whom He receives.” 7 If you endure chastening, God deals with you as with sons; for what son is there whom a father does not chasten?” (Heb 12:6-7). “6 So the LORD said to Cain, “Why are you angry? And why has your countenance fallen? 7 If you do well, will you not be accepted? And if you do not do well, sin lies at the door. And its desire is for you, but you should rule over it.”” (Gen 4:6-7). Here in the previous verses we see how God is concerned for the life of a man who was angry with Him. God knew that if Cain would continue to allow sin rule his life without resisting it, it will eventually kill him (Ezek 18:20, 23). God hates sin because it kills the man he loves so much (Rom 6:23; 8:32). Even though wickedness of Satan and his demonic cohorts were conceiving the death plot of Cain, God in his love as a father pities over his child He pitied over Cain and was pleading with him from His heart to renounce his evil works (Ps 103:13-14; 1 Tim 2:4). In other words God was saying to Cain, “Why are you angry my boy and are so upset with me, if you choose to do what I have said to you by your faith, you will be protected from sin which eventually leads to eternal death (1 John 5:16-18), if you reject to choose the right sacrifice of a sheep or lamb that I have instructed you by living in unbelief, the sinful nature which lies at the very soulish door of your heart where all your conscious choice are made, will consume you desirously in to its death grip for eternity ahead. Don’t say why should You allow sin nature to be present inside me and it is not my fault, instead rule over the sin nature by receiving power from Me through your obedience to what I have instructed you to do.’ Sin nature present inside human due to the disobedience of our forefather first Adam to God’s command in the Garden of Eden, brought all humans born to them in to its sinful grip even from all of our childhood days itself (Rom 5:12). The sinful nature sadistically desires to make us sin and thus receive the rightful wages of sin which is death. Death literally means ‘separation’. If we ask the question, from who are we separated when we sin? The answer is, from the God who loves us and blesses us with all good thing to enjoy in this earth and ever after in the new heaven and the new earth (James 1:17; 1 Tim 6:17). But a real believer will always turn back to God through his faith in God’s sacrifice for his sin [i.e. Jesus Christ]. In the New Testament it is our confession to God that we have sinned when we sin that keeps us as a believer in right relationship with God (1 John 1:7, 9). A believer is one who lives by believing in the promises of God. Satan wants to lead people to sin and lead a religiously self-willed life, till they will start to deny God entry in to their lives like Cain (2 Tim 2:12). This is the reason the writer of the Book of Hebrews said, “26 For if we sin willfully [by rejecting to have faith in the sacrifice of Jesus] after we have received the knowledge of the truth [i.e. that we have been forgiven by God for all our past, present and future sins once and for all time (Heb 10:12, 14-18; Eph 4:32) and now adopted in to God’s family as a child of God (Eph 1:5; Rom 8:15) who has the power to rule over sin freely (Rom 6:18-19)], there no longer remains a sacrifice for sins, 27 but a certain fearful expectation of judgment, and fiery indignation which will devour the adversaries. 28 Anyone who has rejected Moses’ law dies without mercy on the testimony of two or three witnesses. 29 Of how much worse punishment, do you suppose, will he be thought worthy who has trampled the Son of God underfoot [by living continually in unbelief], counted the blood of the covenant by which he was sanctified a common thing [by not valuing it to use it by faith], and insulted the Spirit of grace?” (Heb 10:26-29). In the above verses we see that the message is loud and clear, a believer who rejects or denies the covenant of God by his own will, is in danger of judgment along with God’s adversaries. In other words, if what we say we believe does not result in action, then it is doubtful we have really believed it. No matter what sin a believer is involved in, God has given freely His power and protection and guarantee to overcome it because he is His child (Gen 4:7). But a believer who rejects the blood sacrifice of Jesus by his unbelief that has come in because of the allurement of sin, is in danger zone and God also doesn’t like any such person to draw back to perdition (Heb 10:38-39). A saved man cannot be lost because of sin [i.e. the reason? The penalty for all our sins has been “paid in full” through the death of Jesus on Calvary (John 19:30)], but can be lost when he chooses to reject the blood of the covenant which only has the power to save him from his destruction (1 John 5:16-17; Acts 4:12). God saves and at the same time is a gentle man who values the choice of his own child more than His very name (Ps 138:2; Deut 30:19; Josh 24:15; John 6:70). Sin separates a believer from continuing in right relationship with the God of all blessing. But faith in the sacrifice of the blood covenant of Jesus keeps him in the right track (Rom 6:23; 1 John 5:4). This is the reason Jesus said to the believers, “….I have overcome the world.” (John 16:33) and He continued His admonition in the Book of Revelation saying, all those believers who overcome will be rewarded (Rev 3:7, 11, 17, 26; 3:5, 12, 21). The believers are the over comers because Jesus has overcome all the world of Satan and his demonic cohort’s manifestation of sin, sickness and death on behalf of every believer who lives in Him (John 11:25-26). Many exemplary apostolic believers like Paul over the centuries openly confessed, “I have been crucified with Christ; it is no longer I who live, but Christ lives in me; and the [life] which I now live in the flesh I live by faith in the Son of God, who loved me and gave Himself for me.” (Gal 2:20). Cain could have easily asked God to help him correct his wrong religious attitude of pride by humbling himself before him as His child, and thus as a result could have received unconditional grace of God to be blessed like Abel in his life (James 4:1, 6-7). If Cain had humbled himself of his inability to do rightly, he would have received the power of God to reign over the sinful nature which was trying to control him (Rom 5:17; Gen 4:7). Instead, he became very jealous about his brother’s new found favor with God through his personal faith. Pride always leads to jealously, jealousy always leads to murder. These are like twin sisters who can always be seen together. The Bible says, “Now Cain talked with Abel his brother; and it came to pass, when they were in the field, that Cain rose up against Abel his brother and killed him.” (Gen 4:8). First the lie, then the murder happened. It was not manslaughter [i.e. unintended killing] but a culpable homicide. It was a pre-meditated conspiracy that he executed secretly in the open field and in private. Cain became the first murderer after the characteristics of his spiritual father the devil, because he has chosen his life to be controlled by his soulish sinful nature without repentance or confession to God for the wrong things he did (John 8:44). The religious soulish attitude of life in Cain hated the true spiritual attitude of faith in God and it led to murder. The religious life of man will always try to destroy the Spiritual life of God on earth which He works through the people who believe Him and His promises (Gal 4:29; 5:17). Man made religion to quench the God given thirst inside him, God only gave true Spirituality to quench the spiritual thirst of man by filling himself through His very own Spirit (Isaiah 44:3; Matt 5:6; John 4:14; 6:35; Eph 5:18). Religion is a product of man’s striving made on earth, Spirituality is a product of God’s very own life of heaven lived by Him through His offspring’s on earth. True Spirituality connects to heaven and brings it to the earth, when earth receives heaven God will release tangible heaven materials and His very own presence on earth and let others in the family of faith enjoy it (Matt 6:10). God’s families of faith on earth are those who give Him the legal rights to live through them (Gal 2:20; 2 Cor 5:15; Phil 2:13; Acts 17:28). God’s antidote to man’s religiosity is Spirituality, which means ‘living in the things of the Holy Spirit’ [Note: this includes all the things of the Spirit like dreams and visions (Acts 2:17), fruit of the Spirit (Gal 5:22-23), gifts of the Spirit (1 Cor 12:7-11) and all that which includes the pure workings of the Spirit]. 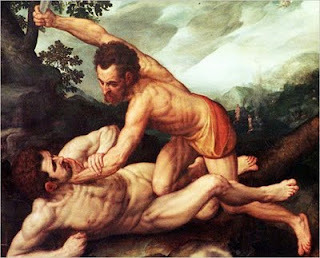 God has made the story of Cain and Abel to be a metaphor of man’s religion verses God’s spirituality. All that has been initiated from man and his works to reach God will always without fail end in death (Matt 7:13-14; Rom 6:21). Religion and its people who follow it have always been the greatest cause of wars and bloodshed against the true spiritual people of faith who followed God since the creation of the earth (Mt 23:35; Jude 11; 1 John 3:12; Rev 17:6; 18:24). But true Spirituality is the answer to solve all peace less chaos happening on earth both inside man’s heart and in all outside circumstances humankind is facing (Luke 21:25-28; 2 Cor 7:5). Man in the end times has to look up to heaven to quench the Spiritual thirst which is increasing day by day on earth. Jesus instructed the men and women in the end time generation to look up and not among them for solution to their own life’s and world’s problems (Luke 21:28). Then the story continues in sadness but with the righteous judgment of God. “9 Then the LORD said to Cain, “Where is Abel your brother?” He said, “I do not know. Am I my brother’s keeper?” 10 And He said, “What have you done? The voice of your brother’s blood cries out to Me from the ground. 11 So now you are cursed from the earth, which has opened its mouth to receive your brother’s blood from your hand. 12 When you till the ground, it shall no longer yield its strength to you. A fugitive and a vagabond you shall be on the earth.” (Gen 4:9-12). In the preceding verses when God asked Cain about his brother’s where about, it is not that He knew nothing about it. He was watching over Abel and He knew everything that had happened to him as the Bible says “And there is no creature hidden from His sight, but all things [are] naked and open to the eyes of Him to whom we [must give] account. ” (Heb 4:13; Prov 5:21). The Great Righteous Judge and the moral governor of the whole universe knew all that had happened to Abel because his eyes were running throughout the earth to show himself strong on behalf of righteous people like Abel whose blood cried out to God for justice (2 Ch 16:9). Abel’s blood cried out for God’s justice and vengeance to be fulfilled towards Cain the offender. The answer that Cain gave to God saying, “I do not know. Am I my brother’s keeper?” is an outright lie and that of Sarcasm. Religious people will always easily say a lie to defend themselves because they will be so used to living by the soulish sinful nature that they will not even realize that they are saying a lie when they say it. Whatever the Lord hates and is an abomination to Him, Cain did without even a slightest remorse on his part for having done it. The Bible says, “These six things the LORD hates, yes, seven are an abomination to Him: 17 A proud look, a lying tongue, hands that shed innocent blood, 18 A heart that devises wicked plans, feet that are swift in running to evil, 19 A false witness who speaks lies, and one who sows discord among brethren.” (Prov 6: 16-19). Cain in his evil characteristics fulfilled all of the above six things that the Lord hates and even the seventh thing which is absolutely abominable to the Lord, he had done this by giving heed to the very voice of Satan himself who must have orchestrated the whole event by sowing discord between Cain and Abel initially and thus eventually making Cain’s heart so hardened that he even lied casually to the Lord God Almighty. This shows that Cain was completely immersed in walking according to his own innate sinful nature, that he fulfilled all that the Lord hates and is abominable to Him and the sad thing is that he sarcastically enjoyed it. The bottom line is, Cain was a evil man who has completely given himself to the wicked one [i.e. Satan] and this is one of the main reason the Lord rejected Cain’s religious sacrifice (1 John 3:12). Cain by living in unbelief has completely rejected the Lord and His precious sacrifice. Because he by his own choice has rejected the ultimate forgiveness of all sins through a blood sacrifice which represented the coming Messiah, there was no more sacrifice left to save Cain from his sin nature which led him towards death physically and eventually eternal spiritual death (Heb 10:26; Rom 8:13). When God speaks the truth immediately without fail the spirit mind of man which is the conscience will suddenly get activated and one’s thoughts will either accuse them if they have lived in unbelief or excuse them if they had lived by faith in God’s perfect sacrifice which got culminated in Jesus Christ (Rom 2:15; Heb 10:11-14; 1 Cor 4:5). In this way, God demonstrates at the present time his righteousness by being “…just and the justifier of the one who has faith in Jesus.” (Rom 3:26). Whatever word God has spoken to man will become his judge (Jam 4:17). This is the reason Jesus said, “He who rejects Me, and does not receive My words, has that which judges him--the word that I have spoken will judge him in the last day.” (John 12:48). This is what happened to Cain, the moment God spoke the truth, Cain was convicted by his own guilty thought that condemned him and gave witness to his evil works which he had done in murdering his brother Abel because of jealousy. Once God said to Cain, “What have you done? The voice of your brother’s blood cries out to Me from the ground.” (v10), these words of God became the truth to judge Cain. When God speaks, whatever words that comes out of his mouth is the truth. God cannot lie and hence all His words are nothing but the truth (Tts 1:2). When Pilate the Roman governor asked Jesus, “…What is truth?” (Matt 27:2; John 18:38), he failed to perceive that he was standing before the embodiment of truth which is God Himself in the human flesh standing before him (John 1:1-4). It was Pilate’s spiritual darkness in him mind that did not allow him to see the very truth of very truth standing before him (Matt 6:23). The Bible says, “…the light [of Jesus] shines in the darkness, and the darkness did not comprehend it.” (John 1:5). Exactly as had God ordained on that day, the light of Jesus was shining upon Pilate at that point of time and he himself confessed about the brightness of that Divine light by saying, “I find no fault in Him at all.” (John 18:38, c). Yet this man failed miserably to understand the light of Jesus inwardly in his heart to let it change him with the transfusion of God’s life (John 18:33-37). Some people pass through the way of life by just walking through the light of God’s truth and yet fail to recognize and receive the spiritual application of the light of God’s truth in their lives because of hardened and a darkened heart by Satan (2 Cor 4:4). It is like a person with color blindness failing to notice the very color that is displayed before their very eyes. If only they would from the heart begin to seek God by humbling themselves before God, the glory of God’s light would break in to them like a shining light peeping itself in to a long tunnel cave (1 Pet 5:6; Matt 13:4-5; 1 Cor 4:4-6). Another important thing to note in the phrase “The voice of your brother’s blood cries out to Me from the ground.” (v10) is, even after their death the righteous people’s hope for justice is not from the world system of Satanic governance but from God whom they have believed during their lifetime and also in their death too (Rev 6:9-11). Whether in life or in their death, in times of sadness or in gladness, in riches or in rags, in sickness or in wellbeing, the souls of the righteous faith people always waited and expected God to act on their behalf and trusted Him without an iota of doubt that He will stand on their cause one day and fulfill justice and establish righteousness in this same earth (Ps 62:5; Isaiah 30:18; Job 19:25). God never failed Abel’s expectation and He will also never fail all of us who are faith people whose only trust and expectation is from God alone. By standing on behalf of righteous Abel cause, He has proved that He is “…not the God of the dead but of the living, for all live to Him." (Luke 20:38). In other words, even though Cain killed Abel and as a result he was no more alive on earth, he was alive in the paradise according to the perfect knowledge and omnipresence of God (John 11:25; Luke 16:22). After the resurrection of Jesus Christ for the past two thousand years, all those who have died believing in Christ Jesus are taken directly to the presence of God in heaven (Phil 1:23; 2 Cor 5:6, 8; Acts 7:59-60). All the saints who lived before the resurrection of Jesus due to the reason of being not born again in their spirit, they were comforted in the place called paradise or Abraham’s bosom or prison or Hades (Luke 23:43; 16:22-23; 1 Peter 3:18-19; Acts 2:27, 31; Matt 11:23). There was another section in Hades for the wicked dead who died in unbelief, and a chasm existed between the righteous people who were comforted by God’s dead saints and the unrighteous people lodged in torment (Luke 16:25-26). But at the time of Jesus resurrection from the dead, He took the entire captivity in the righteous section of Hades captive directly to the presence of God in the third heaven because all of the righteous were born again after the death and resurrection of Jesus Christ (Eph 4:8-10; 2 Cor 12:2; Is 26:19; Matt 27:51-54). These people were born again when Jesus proclaimed the mystery of the Gospel to them after His death by the Spirit of God who took Him to Hades (1 Peter 3:18-19). Now the righteous section of the Hades is empty and also both the key of death and Hades are in the hands of Jesus Christ (1 Cor 15:55; Rev 1:18). Praise the Lord! This story of Cain and Abel is just a model story to prove to the coming generations of believers that God Almighty will surely stand for the cause of the righteous one on earth and implement with them by force His righteousness on earth as it is in heaven on that day of thousand years reign on earth (Rev 19:11, 15). On that day the prayers of all the saints of all the ages who prayed the Lord’s Prayer “Your will be done on earth as it is in heaven” (Matt 6:10) will be absolutely implemented and maintained by force. When God said to Cain, “The voice of your brother’s blood [‘dam.Heb’ which means 'drops of blood'] cries [tsa’aq.Heb, 'to shriek, cry out in anguish and fear (27:34; 41:55; Ex 5:15; 8:12; 14:10, 15; 15:25; 17:4; 22:27; Ps 107:6)’] out to Me from the ground.” (v10)”, What God was saying is, ‘Abel is crying out to me about the aborted plan that I had for him and his posterity for eternal generations which was cut off forever by his death.’ In murder, one not only sins against God and the man he kills (Gen 9:6), but also against the murdered man’s posterity for eternal generations. Unsuspecting Abel may have cried out thus to God and to Cain. God had compassion; Cain showed no concern (v9). In other words, God had a plan to bring a godly line of faith people for Himself through Abel. Satan wanted to destroy that God’s plan completely (John 10:10), sadly he did not understand that God’s plan and purposes can only be delayed because of His created beings disobedience and rebellion, but cannot be destroyed because He is wiser than all and is persistent to fulfill it (Isaiah 46:8-10; Prov 2:6; 1 Cor 1:20; 2:14). Before the fall of Satan from heaven, God gave him a clear conscious choice between choosing to be prideful based on his beauty or stay humbly choosing the eternal wisdom of God. But Satan chose to isolate himself from God based on his own splendor and beauty which God had given him, in this he corrupted his wisdom (Ezek 28:17). It was Satan’s own conscious choice to separate himself from God that made him to fight out against God in his own foolishness till his end which will come very soon in the future (Isaiah 54:16; Rev 12:12). When God finally judged Cain, the rightful Judgment of God brought only curses upon Cain. As apostle Paul rightly said, “For as many as are of the works of the law are under the curse; for it is written, “Cursed is everyone who does not continue in all things which are written in the book of the law, to do them.”” (Gal 3:10). Cain tried to play religion before God and as a result he got rightly cursed as a result of it. Thus God righteously said to Cain, “11 So now you are cursed from the earth, which has opened its mouth to receive your brother’s blood from your hand. 12 When you till the ground, it shall no longer yield its strength to you. A fugitive and a vagabond you shall be on the earth.” (Gen 4:11-12). What can we learn from this, don’t ever try to play religion with God and disqualify yourself from receiving his goodness, mercy and love of His salvation. The works of our hands and strength disqualifies us from having relationship with a perfect God because our best works are nothing but imperfect works before Him (Rom 4:4; 11:6; Gal 2:16, 21). But our faith in His perfect sacrifice prepared by Him has never ever failed humankind to secure and qualify us to have relationship with Him freely since the time of Creation (Rom 4:5; Heb 11:1, 6). So be a man and woman of faith and not of works. Faith person is truly declared by God as the true Spiritual person (Heb 11:4). Religious works based person like Cain is declared as a wicked and evil man of self-righteousness (1 John 3:12). Faith life brings you humility which makes God bless you abundantly, at the same time the life of a works based religious person He hates and curses him (James 4:6). So you decide your future destiny. One of the reason there was no death penalty given by God here was because there was no law against murder yet (Rom 7:7-25; Gal 3:19-25). First law against murder came in to existence after the flood (Gen 9:6). All men were declared to be under sin by God during this pre-flood age since creation, so that he planned to show mercy to all who believe in the sacrifice of God which pre-figured Christ (Rom 2:11-13; 5:13-14; 3:23-26). O what a God of mercy! God by saying to Cain, “…you are cursed from the earth”, was giving chance for him and his progeny to turn back to Him still. By placing a curse apart from the already placed curse upon the earth which He decreed after the fall of Adam and Eve (3:17-19), God caused Cain’s occupation much harder to do (Gen 4:2, 12). At least in his hardship God wanted Cain and his offspring to look to Him and be saved from eternal destruction (1 Tim 2:3-4; 2 Peter 3:9; Ezek 18:23, 32; John 3:17). If God had cursed Cain he would have immediately died physically and spiritually forever because the wages of sin is death (Rom 6:6:23). In this judgment God’s glory was displayed when He concealed this matter of evil that Cain did and showed His mercy to this man and his descendants who doesn’t even have the rights to live on earth as he was a murderer proved guilty (Prov 25:2). Even in this act of justice, God’s love manifested (Prov 10:12). Again in the curse which God spoke saying, “When you till the ground, it shall no longer yield its strength to you. A fugitive and a vagabond you shall be on the earth.” (Gen 4:12). The continuation of the curse is that Cain will be a fugitive and a vagabond. The Hebrew word for ‘fugitive’ is ‘nuwa’ which means ‘to waver, go to and fro.’ And the Hebrew word for ‘vagabond’ is ‘nuwd’ which means ‘to flee, wander’. The heart which is full of fear and doubting, not knowing how to do a steady work in a place is a wavering and wandering heart which comes as a result of the lack of the presence and counsel of God (Duet 28:65-66; James 1:6-8; Luke 21:26), this is a curse for all religious unbelievers and rebellious people who have a form of religion but deny the power of God to transform them (2 Tim 3:1-5). According to the fulfillment of this curse, a little later Cain stepped out from the presence of God to fulfill his own plan and walk in his own way after he finished talking with God (Gen 4:16). The man of religious sinful flesh killed the man of the true Spiritual faith. Cain acted as the seed of the serpent and Abel acted as the seed of the Woman (Gen 3:15). Because the godly seed of faith which was in Abel was destroyed by Satan and his demonic cohorts, God appointed another faith seed named Seth and through Him fulfilled His godly plans and purposes. God’s purpose of raising up a set apart godly people in the planet earth who would call upon Him from a pure heart of faith was delayed because of the death of Abel, but it was not destroyed as Satan thought (Acts 26:18). Satan has always opposed the plans and purposes of God by instigating evil through human beings and even opposing directly against God’s messengers [i.e. humans and angels alike (Jude 1:9)] and holding them back to keep them from fulfilling the purpose of God (Dan 10:12-14; 2 Tim 4:14, 17-18; 1 Thess 2:18; Rom 1:13; 15:20-22). Later God must have revealed to Eve before Seth was born that He is going to give a son as a substitute for Abel through whom a godly generation must come forth, so she named the baby boy whom she brought forth as ‘Seth’ which means ‘God has appointed him as the substitute to bring out a godly set apart generation instead of Abel.’ This is why in Gen 4:25-26 the Bible says, “25 And Adam knew his wife again, and she bore a son and named him Seth, “For God has appointed another seed for me instead of Abel, whom Cain killed.” 26 And as for Seth, to him also a son was born; and he named him Enosh. Then men began to call on the name of the LORD [Note the emphasis “Then men began to call on the name of the LORD”].” These preceding verses clearly reveal that God raised up a people who began to call upon him, and accordingly he set apart for Himself a people who are godly (Ps 4:3). Thus God began to have the last laugh of victory for every evil thing that Satan did and it frustrated him further (Ps 2:4; 37:13; 59:8; Rev 12:12). Once Cain realized that he has received the curse of God rightfully according to his works of evil, he began to realize the magnitude of what God has told to him. Then Cain began to negotiate to the Lord for special reprieve and protection from Him. The Bible clearly continues saying, "13 And Cain said to the LORD, “My punishment is greater than I can bear! 14 Surely You have driven me out this day from the face of the ground; I shall be hidden from Your face; I shall be a fugitive and a vagabond on the earth, and it will happen that anyone who finds me will kill me.” " (Gen 4:13-14). At least at this point of time after he got convicted and received a right judgment from the Lord he had a chance to humble himself to the Lord for all the evil he had done, but the religious attitude in Cain never allowed him to do it. But instead he was having self-pity for himself and his future on earth and does not even think for a moment that he needed forgiveness for his wrongly committed sins so that he could lay hold of eternal life ahead with God. The man who showed no concern for the life of Abel is suddenly acting so concerned about his own life. To break such stubborn religiously deceptive self-pity in one’s life Jesus rightly taught people saying, “…whatever you want men to do to you, do also to them, for this is the Law and the Prophets.” (Matt 7:12). This is true Spirituality. Religious spirit will always blind a person from the true eternal life and thus denying healing for the soul (Acts 28:24-27). When Cain said, “My punishment is greater than I can bear… You have driven me out this day from the face of the ground; I shall be hidden from Your face; I shall be a fugitive and a vagabond on the earth … anyone who finds me will kill me.” (Gen 4:13-14). Cain was more concerned about his temporal punishment on earth rather than a eternal everlasting punishment of being thrown away in to the eternal hell fire in which there will be no presence of God because of the works of sin and evil done in one’s life (Matt 25:40-41, 45-46; 2 Thess 1:8-9; Rev 20:11-15). Cain was also more concerned about people killing his life on earth rather than God who has the power to kill Cain’s soul and body in hell (Matt 10:28). Because he was a religious man, Cain was more fearful of people than have the real fear of God. The fear of man will make a man to trust in his flesh for strength and will always cause his heart to depart from the Lord to bring a curse upon one’s life (Jer 17:5). The religious attitude in Cain brought the fear of man as a snare to keep him in its religious hold, till he died without the real life of God which can only lead to eternal life (Prov 29:25; 19:23). Religious people will not be long sighted towards eternal life but rather are always short sighted with earthly life and will always choose to enjoy the temporal pleasures of sin and unbelief (Heb 11:24-25; 1 John 2:15-17). Cain as a religious man was concerned being hidden from God’s face because he was fearful of lack of sustenance and survival on earth as God is the only source of all good things for any human being who is either evil or good (Matt 5:45; James 1:17; 1 Tim 6:17). Cain was completely lost in his religiosity. The bottom line is, all the ‘isms’ like Judaism, Islamism, Buddhism, Hinduism, Taoism, etc… still operates under the same principle of Cain saying, ‘I will do something to earn the favor of God on earth. I will do and do and do until I die, so that God will be indebted to give me a place for me in heaven because of the good works that I have done for Him. I deserve it.’ More or less all these religions operate under the same principle of doing something for God in order to be saved and forgiven from sin and evil. This way is the broad road in which many are travelling which will eventually only lead to death in the end (Matt 7:13). Like Cain many of these sincere religious people bring the works of the hands which is under the curse of God as an offering to receive forgiveness of sins, this will be as much rejected by God as the offering of Cain. But true Christianity is not a religion. It is a spiritual relationship with God where all those who believe in the blood sacrifice which prefigured Jesus Christ and got fulfilled in Him believe in it for forgiveness of all their past, present and future sins and come before God in faith, thus getting justified for doing the exact thing God has prescribed. And therefore God also just as He promised becomes the justifier of all those who believe in Him (Rom 3:25-26). All the religious system says, ‘do and do more until you die’, but real spirituality which is only in Christianity says, ‘It is done forever and is finished forever; enjoy your life with God for eternity by faith in Jesus’ finished work of salvation for eternity ahead.’(John 19:30; Heb 10:12, 14). Will you work for salvation and favour of God as a religious person or just rest in the finished work of the prescribed blood sacrifice of Jesus and live as a spiritual person? You decide. Working to receive salvation and favor of God will bring a curse, but just resting in the finished work of Jesus for you will automatically bring the eternal salvation and favor of God over your life (Gal 3:10; Heb 4:9-11, 16; Rom 5:8-10, 1). When you work for salvation, God becomes a debtor to you which in fact He is not to anybody (Rom 4:4). If you just by faith believe in the prescribed blood sacrifice of Jesus as the only solution for the forgiveness for all your sins and right relationship with God, God himself and all his goodness becomes an unconditional gift to you which is real spirituality (Eph 2:8-10; Rom 3:27; Gal 2:16; 6:1; 1 Cor 2:15; 3:1; 9:11; 10:3-4; Eph 1:3; 1 Pet 2:5). So be a true spiritual faith person and a warrior! Amen! The Bible describes the wonderful reply of mercy that the Lord gave to Cain saying, “… “Therefore, whoever kills Cain, vengeance shall be taken on him sevenfold.” And the LORD set a mark on Cain, lest anyone finding him should kill him." (Gen 4:15). In this preceding verse, the Lord has proved that He is not only the God of Justice first but at the same time He is also the God of mercy (Is 30:18; Hos 12:6; Ps 59:17). Our Creator God “delights in mercy” (Mic 7:18) and so He has shown Cain the murderer, not only mercy but also gave protection from being killed by others for the consequence of what he has done to Abel his brother. O what a merciful God! Truly the mark which the Lord had set on Cain is a mark of mercy. Is it a physical mark or a spiritual mark over his body? If it is a physical mark the Lord would have told that it was placed in such and such place in his body visibly, but according to the context we see that the mark is a pledge that God gave signifying that vengeance would be taken sevenfold on anyone who became his murderer. This mark was not a physical mark or a change of color but a promise of God that He will protect him from being killed by anyone who may find him to be a murderer. In spite of receiving the mercy of God, Cain never turned back to God with repentance (Heb 6:4-6). Instead the Bible sadly continues saying, “Then Cain went out from the presence of the LORD and dwelt in the land of Nod on the east of Eden.” (Gen 4:16). Literally the meaning for the name ‘Nod’ means ‘Wandering’. In other words, because Cain chose to leave the presence of God and God’s eternal relationship with Him for an earthly self-willed soulish survival, his heart foolishly led him to the place of wandering where he could never enjoy the presence of God. A wandering heart without the presence of God led Cain to a wandering land. Cain foolishly chose a living hell on earth without the presence of God. Hell is the only place where there will be no presence of God felt tangibly (2 Thess 1:9). Don’t think that it is just the fire and worms that torment people in hell, but it is the lack of the manifestation of the presence of God and His goodness that will torment people in hell (2 Thess 1:9; Rev 22:15; Matt 25:41, 46; Mark 9:44). This also shows that even though we are saved by grace and mercy of God, when we trust in our soulish ways and live in it perpetually, it will dangerously lead us to the place of wandering away from the one sacrifice of Jesus without which we can never enter the presence of God for eternity (Heb 10:19-22). This brings us to the question, ‘Can a person fall away from faith because of his own soulish choice to depart from it?’ Yes by all means. God is no tyrant to hold people in his hands against their own will and choice of their own heart (John 10:27-28), He is a gentle man who will always respect the choice of every man whether saved or unsaved (1 John 5:16-17; Heb 10:26-29; Matt 12:31-32). Here we see Cain chose to depart from the presence of the Lord forever, the Lord did not pressurize Cain to stay in the place of rest in Him but freely honored the desire and will of Cain to go to the place of wandering according to his own foolish choice. When people voluntarily reject the sacrifice of Jesus and choose to go to hell, God because of His love for man will honor man’s choice to follow the devil and his demons to hell fire, which was originally before the fall of man was intended for the rebellious Satan and his demons (Matt 25:41). This is what Apostle Paul told will happen rampantly in the end time which is our present generation, many will depart from true faith and will be deceived if they continue to live in the soulish realm of unbelief (2 Thess 2:3, 11-12; 2 Tim 3:1-5; 4:3-4). So it is better to always humble ourselves in the presence of God and repent, than to continue with our soulish mind when we know that we are wrong (James 4:4-10). So saints be alert during the end times and hence not be deceived by the lies of the devil and his demons! The Bible says, “…whatever is not from faith is sin” (Rom 14:23). Because Cain hardened his heart without faith towards God, the aftereffect affected his entire progeny. The choice that Cain took to go away from the presence of the Lord not only affected him but his offspring which fully became ungodly and sinful forever. As the Bible says, "...one sinner destroys much good." (Ecc 9:18), the one big sin of Cain rejecting the God-ordained blood sacrifice towards God for the forgiveness of sins and to maintain relationship with God, destroyed the much goodness of God and His blessings that should have been enjoyed by his progeny forever (Heb 10:26-31; Gen 4:7). Never forget to remember that whatever things of God you do not value today in your life will not only bring curse on your life in your present and future but also on the generation that will come through you. From this place, God separated Cain and his generation to be an ungodly group because they rejected the God ordained Spirituality of drawing near to God through blood sacrifice of a lamb. When the Bible says that “…Cain went out from the presence of the Lord” (Gen 4:16), it also indirectly implies that God even at that point of time itself God had already established a place or tabernacle of meeting with men where He blessed worshippers (cp. 2 Ki 13:23; 24:20; Job 1:12; 2:7; Ps 51:11; 96:6-8). By rejecting God’s way of worship that He had established for humankind, Cain and his generations after him rejected the God of all blessings to go on their own religious way of living. Then Cain traveled east of Eden and dwelt in the land of Nod [i.e. Lit. Wandering] which was supposed by some to be Eastern Europe and Western Asia or China. Cain fathered an entire ungodly generation under him to finally build a city in rebellion to the instruction that God gave him to work hard in the field (Gen 4:12). Cain built the first city on planet earth (Gen 4:17). Even after the rebellion the gift of God which was given to them before the foundation of the world by God began to manifest (Is 54:16; 28:23-29). Cain’s ungodly generation turned violent day by day before God without the guidance of His Spirit. For example, the same knowledge of a blacksmith that can be used to design a better instrument to plow the field for more efficient grain harvest were instead used to make a sword and javelin to violently kill and defend against humans from invading one another’s territory (1 Sam 13:19). In modern times it can be compared to the production of nuclear material to kill one another because of insecurity and fear of one another (Matt 24:12; Luke 21:26). Because the gift and callings of God are without repentance, Satan and his demonic cohorts began to completely take control of this Cain’s generation and began to use it for their own purpose (Rom 11:29; Luke 4:5-6; Matt 4:8-9). The succeeding generation of Cain built more cities; invented musical instruments; made songs; danced; formed weapons of war from brass and iron; set boundaries around lands, fortified their cities against invaders; invented weights and measures; and in general lived licentious lives before God until judgment had to come. These ungodly people were raiders of reckless character and violent warmongering people of war (Gen 4:18-22; 6:1-2, 4-5, 13). Cain’s leadership as “mayor” of the first city reveals the wickedness of the times (1 John 3:12; Jude 11). When the godly people of God from the Seth line began to mix with the daughters of men from Cain’s ungodly line, the thoughts and imaginations of their offspring and their godly character began to diminish (Gen 5:1-4; 6:1-5). With the exception of Noah, all other godly sons of God from Seth’s genealogies corrupted themselves by their perpetual evil thoughts and imaginations which made the heart of God to be aggrieved (Gen 6:5-6). The children of God practicing evil always grieves the heart of God and it moves Him to chastise them as a loving father chastises his children (1 Cor 11:32; Heb 12:7-8). Even during these pre-flood days, all the sons of God who disobeyed Him by being involved with evil were left to face God’s wrath of flood which destroyed the unbelievers completely. But as they were judged by the Lord in the flesh justly with other unbelievers, they were saved in the spirit when Jesus preached to these same people the gospel of salvation in the prison of Hades and saved them from eternal separation from Him (1 Peter 3:18-20; 4:6). O what a mercy that God has shown these unworthy people! Praise the Lord! Seven is the number of wholeness, Spirituality and the mystery of godliness (1 Tim 3:16). This is the reason the Bible says, “For a righteous [man] may fall seven times and [will] rise again..." (Prov 24:16) because "...the LORD upholds [him with] His hand." (Ps 37:24, 17; 145:14). But because the ungodly generation of Cain substituted self and religiosity for God and His ways, the seventh from Adam and Cain’s line became the first polygamist (4:19) and the second murderer (4:23). This shows the best of human effort without true Spirituality could only produce unsatisfied family life and violent murderous life of wickedness. Such will be the character of our end time generation (Luke 17:27-28). Another thing of note we can find in the generation of Cain is, even though God has shown much mercy to Cain the murderer and his generation and protected it from extinction, they became more violent and showed no mercy to others. The so called perfect show piece that Cain produced not only tried to justify his murder but also claimed on God’s mercy as though God owed him much. In other words Lamech said literally, “I have slain a man who wounded me, and a young man who hurt me. If God protected Cain by a 7 fold pledge who committed willful and planned murder, He will protect me 77fold when I have slain a man in self-defense.” (Gen 4:23-24). Here we see how Lamech had no concern for the human life that God created, loved, sustained and valued. O what lethargy and sarcasm he has showed towards the mercy and grace of God! This is what a religious ‘Holier than thou’ attitude will breed. It will breed more lawlessness due to self-justification (Luke 18:11-12). It is sad to see that the religious attitude in Cain increased ten times in Lamech, until the whole generation got destroyed in the flood. Even in our end times as per what the Bible predicts such religiosity will be rampant throughout the face of the planet earth (2 Tim 3:1-9; Jude 4, 8-11; Titus 1:15-16; 1 Tim 4:1-3; Matt 24:12-14). Beware of such religiosity Saints, lest you fall from your steadfastness of your faith (2 Pet 3:17). All the generation of Cain eventually got destroyed in the flood (Gen 6:8, 18; 7:1). All the branches of the human race as we know now only began after Noah (Gen 10:1-32). What do we learn from these incidents? Did Jesus tell anything specific about these pre-flood days? Yes, Jesus clearly told the end time believers that the state of true spirituality of the world at the end time will be exactly like the pre-flood days, where due to temptation to be conformed to the worldly ways many children or sons of God will mix freely with the world system of governance under Satan and will corrupt their mind of Christ with evil thoughts and imagination of hypocritical religiosity and will bring judgment upon themselves (Luke 17:26-30; 1 Cor 2:16). Many people who will not watch and pray to look forward to escape these evil worldly system of governance, will go through the Tribulation of the end time to be purified by God (Luke 21:34-36; Rev 3:10, 16-20; Dan 11:33-35). But the religious unbelievers of the end time will be completely wiped of the planet earth like the ungodly Cain’s generation before the flood. We see in Gen 6:19-21 God commanded Noah to bring two of every sort of animal in to the ark to keep them alive in the planet earth. And again in Gen 7:2-3 God commanded him to take 7 of each kind of clean animal as well as 2 of the unclean ones. This second command was given to set apart these animals to sacrifice to God by faith after the flood which he did (Gen 8:20-21). But if we ask the question, how did Noah know which were clean and unclean animals and birds, because the Levitical system came through Moses only 1000 years in the future after this event of global flood? The answer is given in Gen 3:21 where the Lord God made tunics of skin and clothed Adam and Eve, thus setting up an institution of Spirituality for mankind through faith in the blood sacrifice rituals which pre-figured the Messiah’s redemptive death for them in the future. He had taught them to shun the work of their hands [i.e. fig leaves covering (Gen 3:7)] to cover their own sins and unworthiness. This faith in God ordained blood sacrifice guaranteed salvation and gave man a choice not to die in his sinfulness and be separated from God forever after his physical death. These group of people who called God by faith believing the blood sacrifice ordained by Him were godly people whom God set apart for Himself (Gen 4:25-26; 5). During the days of Noah, even though there were a lot of sons of God from the godly generation of Seth (Gen 6:1-2), they chose and took wives for themselves from the ungodly line of Cain just because they looked beautiful. This made the godly line to indulge themselves in all kind of evil and their “every intent of the thoughts of [their]…heart” (Gen 6:5) were continually evil. God always sees the intent of man’s heart and not just his actions and judges according to it (1 Sam 16:7; Is 11:3). But outwardly they were playing religion denying the faith that has been given to them from God. This moved God to judge them along with the unbelievers of Noah’s time. The Bible predicts that in the end time such mixture is going to come where godly Spiritual and ungodly religious people will mix and thus be going through the wrath of the end time due to spiritual deterioration by sleeping instead of obeying to Jesus’ command to “watch and pray” (2 Thess 2:3; 1 Tim 4:1-3; 2 Tim 3:1, 5). All the ungodly people of the end time will be thrown in to Hades till the white throne judgment (Luke 16:22-23; Rev 20:11-15). They will all die off the planet earth before the Millennium rule of Jesus by the wrath of God as in the days of Noah and Lot (Rev 16; 19). Beloved saints! Watch and pray so that you may escape all the Tribulation of the end time and be counted worthy to stand in the reward ceremony, the marriage of the Lamb and then enjoy a blissful marriage supper of the Lamb Jesus Christ (Rev 19:7-9; Matt 24:37-39; Mark 13:33-37; Luke 21:34-36). Praise the Lord!